MESQUITE, NV / ACCESSWIRE / April 5, 2018 / PrestoDoctor Pennsylvania Expansion / Cannabis Sativa, Inc. (CBDS) is pleased to announce that PrestoDoctor®, the leading online medical marijuana recommendation service, will be expanding to Pennsylvania on April 20th, 2018. More than 3,800 people have signed up in the medical marijuana patient registry’s first week, signaling strong statewide interest in the program that will give those with one of 17 specific diagnoses access to cannabis beginning next year. PrestoDoctor® is addressing the lack of physicians with its #1 ranked telemedicine platform, which streamlines much of the process. Prospective patients simply fill out a short online application, choose an appointment time, and talk to a physician (http://prestomed.buy-now.co/pennsylvaniamedicalcards). This saves hours of the day, as access to physicians can be made in a matter of minutes, completely online. In addition to enjoying an easier process in pursuing a medical marijuana card, patients using PrestoDoctor® will also receive a customized treatment plan created by a PrestoDoctor® physician. The treatment plans are tailored to a patient’s condition, preferred consumption method, experience, and other lifestyle variables. PrestoDoctor® is currently the only company including customized treatment plans, which helps remove any uncertainty in treatment. PrestoDoctor® will be exhibiting at Cannabis Learn Conference and Expo in the Pennsylvania Convention Center, Philadelphia, PA, April 30 – May 2. 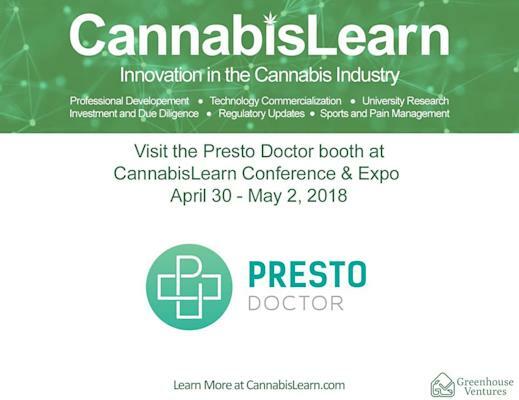 Visit CannabisLearn.com for further conference details and be sure to stop by the PrestoDoctor® booth.